Modern brain research makes an invaluable contribution to successful and efficient communication. How is information received and processed? How do I manage to find the center of the emotions of my interlocutor? What role does biochemistry play in this? How can I influence her? What role does the limbic system play in being successful in relationship management? Learn from our basic understanding of neurocommunication how our brains process communication and empathize. Recognize, understand and optimize your personal patterns of communication and behavior. Train to increase your impact on others, authentic and focused. For customers, colleagues, employees or business partners. The seminars are very practice-oriented. All contents are worked out together in individual or team exercises, case discussions as well as in plenary reflection and discussion. The speaker gives concise input from psychology, communication and management research. The participants have the opportunity to contribute their own practical examples and to reflect them through video analysis. Meaningful method changes enable a high experience and result factor. Specialists and managers who want to recognize and understand communication patterns. They optimize their impact and persuasiveness. for this seminar in Münster. 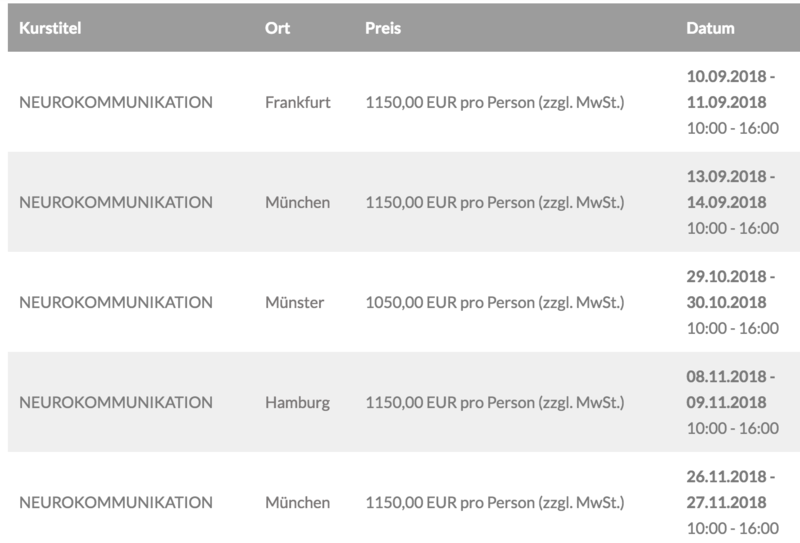 1.150,00 € plus VAT for this seminar in Hamburg, Frankfurt or Munich.